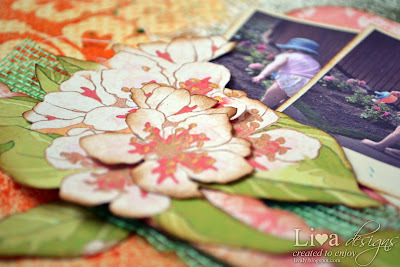 What a joy to be making scrapbook pages again - so missed it! 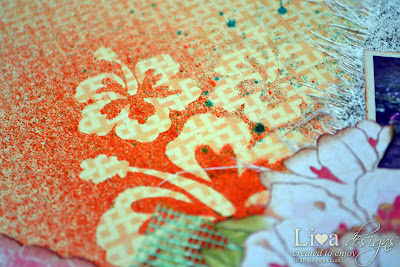 This Friday on Frosted Designs Fabulous Friday is all about fabric. As I wanted to take part in Graphic45 summer layout challenge as well, I chose to use their Tropical Travelogue papers. As the FF challenge is for fabric, I used torn linen square underneath my photos. It was also sprayed with Meadow Color Wash.
As the Travelogue papers mostly have a hibiscus motif going through, I decided to cut some masks with my SDSilhouette, place them on background paper and spray with Stream and Sunset Orange Color Wash. 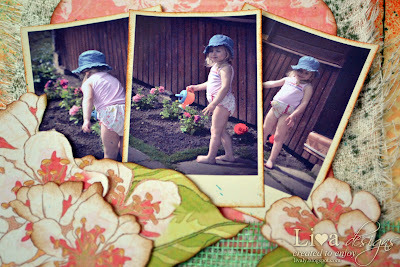 The photos I chose for this layout are with my little Emilia at her grand grandmother garden where she is watering flowers with this tiny watering can. I wanted them to feel more vintage like - more sweeter I suppose. So I found this tutorial of vintage Photoshop effect - it is simply gorgeous. I turned it into an action to use again and again. The best thing about it is that every adjustment can be changed however times you need. So I changed my photos and gave them creamy Polaroid like frames. The best part of this layout was to cut out flowers from Island Jewel paper and pile them in clusters - they are so gorgeous. I covered pollens (are they called that???) of flowers with Glossy accents and must say it really brings these babies to life even if you can't see that in photo. Under these flowers there is a strip of green mosquitoes netting and border sticker. I added journalling tag sticker with torn linen strip. 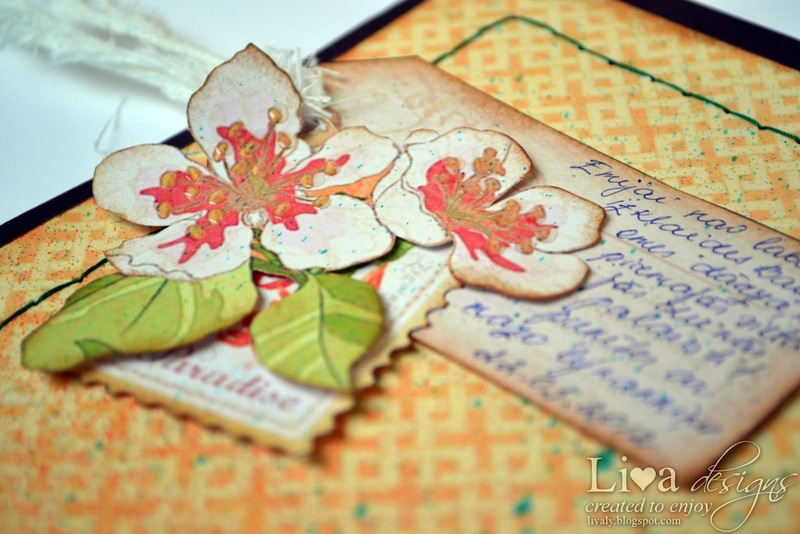 Some cut flowers and punched out stamp from Paradise Postage paper. 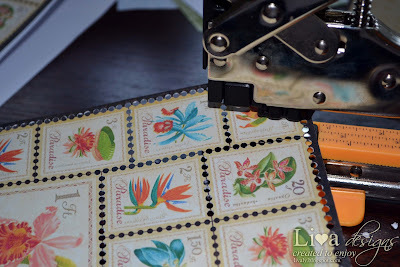 And why I said "punched" stamp - is because I used my Big Bite II to punch out all those small holes around stamps - now I have torn out stamp sheet - that is so cool! Liva... welcome back! It is so great seeing you create again! And this LO is gorgeous!! 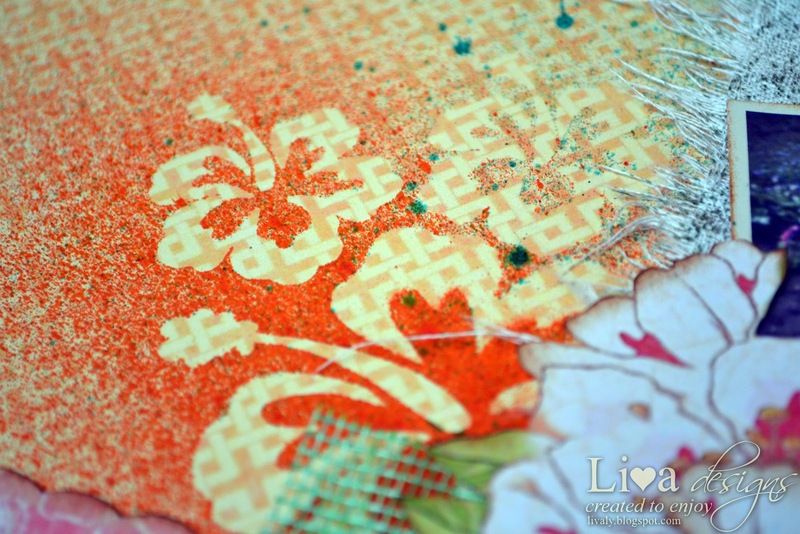 I love the way you used the stencils and mist!! And I can't believe you punched all those tiny holes to create the "stamp"!! So worth it though.... everything is beautiful! The masking you did is absolutely fabulous! Those bright colors make the hibiscus stand out beautifully. Nice job on your homemade 'stamp' & the photoshop effect really is lovely! Thanks for joining us over at OUAS! thanks for join us at OUAS! Really nice collection! i like all of your cards! thanks for sharing. This is such a sweet and delightfully summery page Liva, absolutely wonderful masking/misting and love the layered fussy-cutting! Will have to check out that link on vintage Photoshop effects. Thanks for sharing your page with us at OUAS! Lovely misting and masking. Beautiful bright colour palette. Thanks for playing with us at OUAS. Thank you for playing with us at OUAS this month! Absolutely gorgeous layout Liva with perfect color combi and layering!!! Your Emilia is so cute!!! Thank you so much for playing along with us at OUAS! adorable!! Thank you for playing with us at OUAS! Wonderful layout. Lots of fun fussy-cutting, misting and I love that cheese cloth. I absolutely love your masked background, Live (and I think I'm not the only one lol)!! Your choice of colours is wonderful, also. Thank you for joining us at OUAS!